The uptick in the economy has helped provide everyday people with a little more money to go out and get a natural gas patio heater that can extend the season. Businesses are looking to buy outdoor heaters to provide warmth and comfort to patrons who favor dining in the fresh air. In many ways, a natural gas patio heater is a desirable home luxury item or business investment with a proven ROI. People are quickly turning to AEI’s line of Sunglo and Patio Comfort heaters because they are clean efficient and get the job done. If you are considering a patio-heating product, consider the energy efficiency of natural gas heaters. Food business owners are tasked with watching every dollar due to high overhead costs. A broken refrigerator or excessive waste in the kitchen can drive up expenses. That’s one reason that food service operations look to other resources to increase revenue. Outside natural gas heaters are a key solution in terms of additional business traffic and cost efficiency. Although heating and cooling remain perhaps the largest expense for brick and mortar food businesses, outdoor patios provide additional seating with less overhead. Rather than enclose that space as the winter months approach, it is more cost effective and efficient to buy outdoor heaters and extend the season. The space can provide the experience patrons enjoy and won’t require cooling later. It is common knowledge that gas heaters are very efficient and are less expensive than other options in terms of heating the average home. That concept should not be lost on people looking to buy outdoor heaters. These are some basic numbers to be aware of when deciding considering outside natural gas heaters. Natural Gas: Provides 90-percent heat efficiency. Greenhouse Gases: Natural gas produces fewer harmful sulfur dioxide and nitrogen oxide emissions. In terms of an energy source, a natural gas patio heater far outpaces the energy-efficiency of its traditional counterparts. Natural gas is also a positive alternative to energy sources to those that release excessive and harmful greenhouse gases. Perhaps the best way to decide about utilizing natural gas patio heaters is to speak with a friend or business owner. One of the key differences that surface is that actual users quickly discover that the convenience of being able to turn a switch and be comfortable is amazing. In order to enjoy the warmth and efficiency of a natural gas heater, home and business owners will need to have a viable gas line in place or have one installed. If you have an existing line, consider having a professional inspect it before setting up your new heater. And, always work with a certified professional when adding a natural gas line. That being said, purchasing top of the line models tends to be more cost-effective because of their durability and welcoming design. Keep in mind, these are not furnaces tucked away behind a wall. Patio heaters are part of your outdoor décor. AEI has two lines that make good sense for home and business owners. The Patio Comfort models are made from gorgeous stainless steel and enjoy excellent safety features. 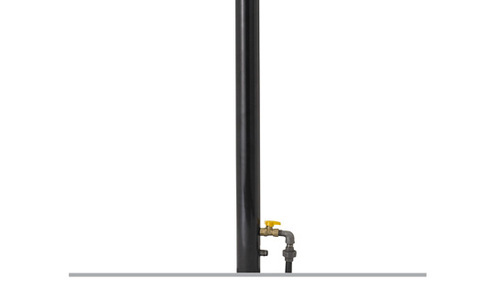 The Sunglo line offers a black, classic finish and produces 50,000 BTUs per hour. If you are looking to utilize the efficiency of a natural gas patio heater, consider these options.